The Atlantic City boat show is underway at the Atlantic City Convention Center. Hundreds of boats are on display, from luxury sailing yachts to performance boats. There are also hundreds of booths set up to showcase the latest in marine technology. The boat show runs through Sunday. This weekend you can go back in time... all the way to the 1920s to be exact. There is a new exhibit at the National Constitution Center that features the prohibition era. More than 100 rare artifacts will be on display. The American Spirits: The Rise and Fall of Prohibition opens Friday and will be on display until July. "The Curious Incident of the Dog in the Night-Time" takes the stage at the Academy of Music. The New York Times has hailed the Tony Award-winning new play as "One of the most fully immersive works ever to wallop Broadway"
The Sixers host the New York Knicks on Friday night. They're right back at the Wells Fargo Center Saturday night to take on the Detroit Pistons. The Academy of Natural Sciences of Drexel University celebrates all things prehistoric this weekend. 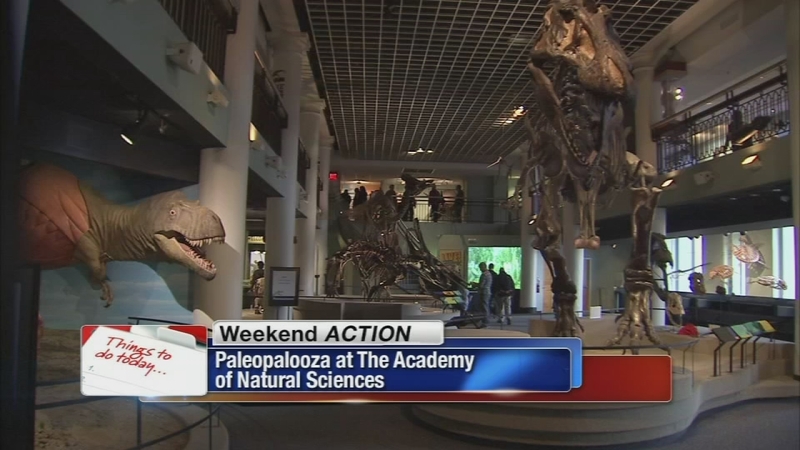 Paleopalooza, a festival of fossils, features shows and exhibits. The two day event on Saturday and Sunday is free with general admission. Check 6abc.com next week for more weekend action. Weekend Action: Easter Promenade, Easter egg hunts, Union Kids' Day, Monster Jam and more!